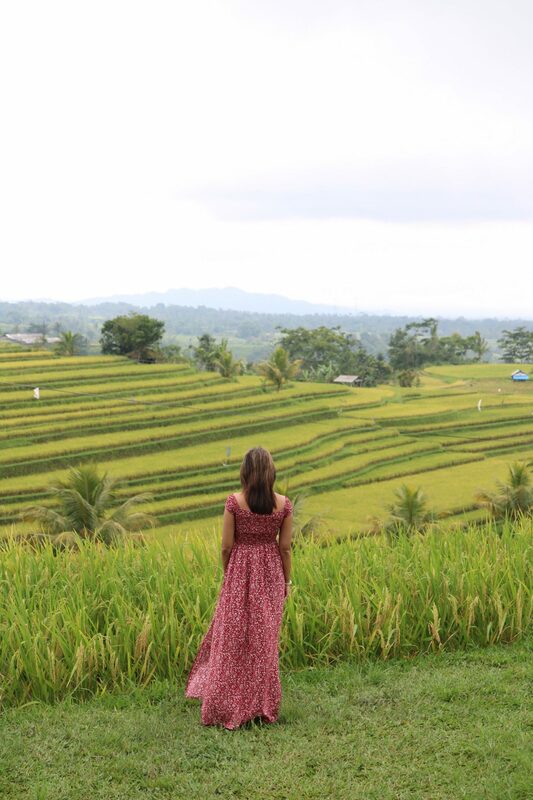 Bali has been on my bucket list for so long that it was about time I ticked it off, and of course having read ‘Eat, Pray, Love’ served to push it further up the list. I combined the “Island of the Gods” as part of a dual destination trip with Hong Kong as I found an amazing deal on Cathay Pacific. I always book my trips myself, searching out the best flight deals and working out how long I want to spend at each destination. For this trip, I wanted to escape to a tropical hideaway where I could relax on the beach, tick off another item from my bucket list, which was to visit a rice terrace, see some interesting temples, indulge in the local cuisine and gaze at the magnificent landscapes, especially the volcanic mountains, as I love geology. The volcanoes part, unfortunately didn’t happen as it chose that exact week to start erupting, but was nevertheless beautiful to see from afar. I was in Bali for 4 nights, staying in Nusa Dua, and here are my suggestions of what to do there. The rice paddies are just absolutely stunning with their zig zag design and where you can see workers in conical straw hats working the fields. I visited Jatiluwih Rice Terraces, which were once a UNESCO World Heritage Site, and located at the foot of Mount Batukaru. These are a much longer drive than other rice terraces but worth the detour as the views are breathtaking. This is an 11th century temple filled with stone carvings and gorgeous architecture. It is required that you wear a sarong before entering, and sarongs can be borrowed from the hall opposite the temple, across the road. I love witnessing the Hindu influences and was pleased to find the statues depicting the Hindu trinity, Brahma, Vishnu and Shiva inside the grounds. The Rock Bar, which can be found at AYANA Resort and Spa in Jimbaran, is an absolute must. You go down to the bar from the main hotel in a short cable car ride, and the views are spectacular. Cocktails were beautifully presented and tasted really good too. It would be the perfect spot to experience the sunset from. These are utterly scenic with gorgeous fields leading up to the entrance, and with a baby waterfall to see too. You can even go swimming in the water and it is just stunning, with various viewpoints and perfect photo opportunities. It would mesmerise any nature lover. Only half an hour from Ubud, definitely add this to your agenda. While in Bali there is so much amazing cuisine you can try, available almost everywhere, using the freshest of ingredients. My personal favourite was Nasi Goreng, which I just could not get enough of. Satay Chicken was another favourite and really tasty! The local beer, Bintang, is also really popular too, and a refreshing alternative to cocktails. This is a temple not to be missed, and really spectacular. You pass a street filled with various shops and arrive at a temple, where you can see various shrines. Further along, and in low tide, wading across the shore, you can see a temple perched on top of a rock, which is just remarkable. I highly recommend going to see this shrine! Bali’s beaches are beautiful and so take some time out and relax, sunbathe, catch up on reading a book or just have a little snooze. The sea is gorgeous so make sure to dip your toes in or go for a swim too. At our hotel we were lucky to see a performance of the Kecak Fire Dance, which is one of Bali’s most iconic art performances. You can see this at your resort if it forms part of the entertainment, or the Uluwatu temple. Whether at your resort or at a Spa, no holiday is complete without a Balinese massage to have you feeling ultra relaxed. I opted for a foot massage by the beach so that I could inhale all that fresh tropical air whilst being pampered. I highly recommend hiring a private driver for a day (costs 40-50 dollars) and this will enable you to see so many sights at your own pace and is more cost effective than doing a guided tour. We covered most of the main sites in one day leaving the much desired chill time for the rest of our holiday. I stayed at The Laguna Bali, which is located in Nusa Dua, just 30 minutes from the airport. You can read my review here. There are direct flights from either Hong Kong or Doha if you are travelling from London and so I would recommend a layover for a few days in either destination. I flew with Cathay Pacific to Bali, and due to Mount Agung erupting, I was transferred to Qatar Airways for my return flight via Doha. At most temples it is compulsory to wear a sarong, and you can borrow these at the temples themselves. As Bali is a humid and tropical destination, the likelihood of being bitten by insects is high and so I recommend always spraying some anti repellant and sleeping with a mosquito net. I did so many of these thing too. Bali is the best isn’t it!! Bali is so high on the list,. Love to combine it with Hong Kong like you did.